First mobile app Profit Accumulator in the Play Store! Wow, it's been a while since I wrote a post. Most of my evenings have been busy with a website a friend told me about called Profit Accumulator. 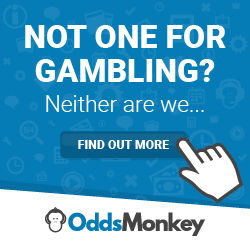 It's a great a site, with lots of videos that explain how to do matched betting. This is not gambling. It's a system where you place bets on all outcomes, so you can't lose. You then do the same with the free bet and pocket the money! It's all legal and completely tax free! I have been doing it for over a month, following the member offers, and made over £1,000. If you're in the UK, I would recommend you sign-up for the free membership and make an easy £45, risk free. Anyway, back to the reason for this post... as you know I have been busy trying to find the time to finish my Android platform game. It's still 'almost there'. 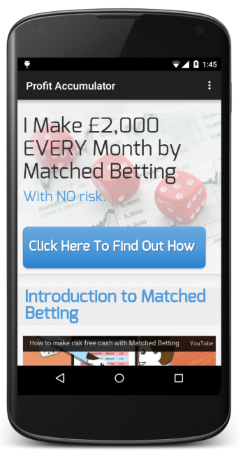 However, while I have been using the Profit Accumulator site, it made me realise it needed a mobile app, as the website was very hard to navigate via my phone. So over a few nights I have created a simple Android app that uses a webview and intercepts the stylesheet with a custom set that renders the site much better on a phone and tablet. I can't believe how little time it took to create this, compared to my platform game! Just a quick update. This application will be unavailable from the Google Play Store from Monday 27th June. This is because the owner of the site has contacted me requesting I take the application down for the time being, as they are planning an exciting new website upgrade. Hopefully the application will be back in the future.